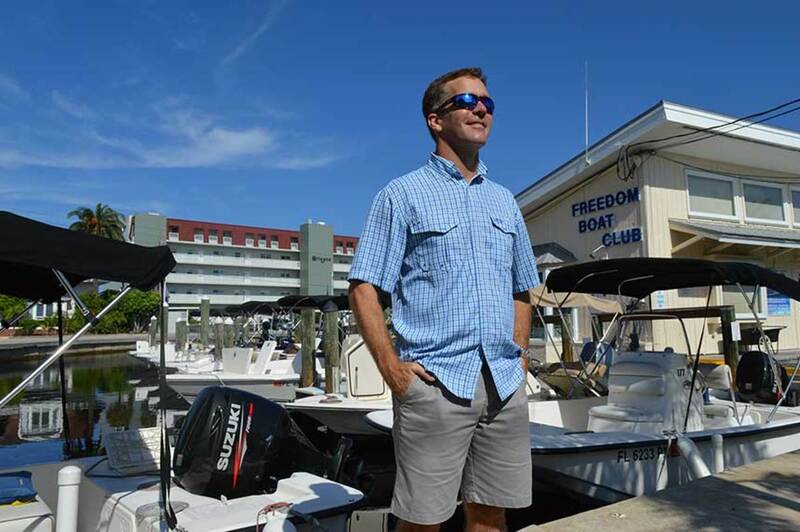 While business is good, Freedom Boat Club president John Giglio is keeping a close eye on the economy. A widely followed measure of consumer confidence rebounded strongly in February, and Federal Reserve Chairman Jerome Powell voiced optimism in congressional testimony that the U.S. economy will continue to expand solidly this year, though perhaps at a slower pace. The Conference Board reported that its Consumer Confidence Index rose from 121.7 in January to 131.4 in February. The gauge of Americans’ views on present conditions rose to an 18-year high. “Consumer confidence rebounded in February, following three months of consecutive declines,” Lynn Franco, senior director of economic indicators at The Conference Board, stated in a press release. The U.S. Commerce Department reported that the nation’s gross domestic product declined, with growth at an annual rate of 2.6 percent in the fourth quarter of last year compared with 3.4 percent in the previous quarter. “I think this is a slowing,” Lewis Alexander, chief U.S. economist for the global investment bank Nomura, told The New York Times. “I don’t think this is ‘we’re falling into an abyss.’”Growth for all of 2018 was at a pace of 2.9 percent, up from 2.2 percent in 2017. Tax cuts that encouraged consumer and business spending, and increases in government spending, helped to boost gross domestic product last year. Powell, delivering the Federal Reserve’s semiannual monetary report to the U.S. Congress in late February, said the economy grew at a “strong pace” last year, but he also said recent months have presented challenges. “While we view current economic conditions as healthy and the economic outlook as favorable, over the past few months we have seen some crosscurrents and conflicting signals,” Powell said. “Financial markets became more volatile toward year end , and financial conditions are now less supportive of growth than they were earlier last year. Separately, Powell said the central bank would be “patient” in deciding future policy on interest rates. Powell’s remarks came after a January meeting at which the Federal Open Market Committee, the Fed’s rate-setting body, decided to pause its policy of gradual rate hikes. The target federal funds rate is now at a range of 2.25 percent to 2.5 percent. The Conference Board reported that its Leading Economic Index declined 0.1 percent in January, to 111.3, according to preliminary estimates. The index attempts to predict economic activity. John Giglio, president and CEO of Freedom Boat Club, said “the U.S. economy is still reasonably healthy, but there are signs of a slowdown. As we continue to monitor the recreational vehicle and marine sectors, there is still consumer demand for both products, but it appears the supply chain is shifting slightly toward a push instead of the pull, unlike what we have seen in recent years. Giglio said Freedom Boat Club watches consumer confidence, interest rates and the housing market, and closely monitors the RV sector. “Historically, the recreational marine industry lags about six months behind the RV trends,” he said. Giglio says Freedom Boat Club had a strong year in 2018 that marked its 10th successive year of double-digit revenue growth and strong profit growth. “As the economic uncertainty continues, we are poised for another strong year,” he said. The University of Michigan’s Consumer Sentiment Index was at 93.8 at the end of February, up from 91.2 at the end of January but below the mid-month February reading of 95.5. The mood of the small-business community darkened in January. The National Federation of Independent Business reported that its Small Business Optimism Index fell 3.2 points, to 101.2. It was the lowest reading since the weeks that led up to the presidential election in 2016. According to the NFIB, the lower reading indicated uncertainty among small business owners because of the 35-day partial government shutdown and instability in the financial markets. The NFIB also reported that business owners expressed concerns about future sales growth and business conditions later in the year, although hiring, hiring plans and job openings remained strong, and inventory spending and capital spending were solid. Falling gasoline prices helped to restrain inflation in January. The U.S. Department of Labor reported that the Consumer Price Index was flat for the month, further reducing the pressure on the Federal Reserve for any increase in interest rates in the near future. For the 12-month period through January, the CPI rose just 1.6 percent. The so-called core rate of inflation, a measure that strips out volatile food and energy prices, rose 0.2 percent in January. The yearly increase in the core rate was 2.2 percent. In a report delayed by the government shutdown, the U.S. Department of Commerce reported that retail sales fell 1.2 percent in December. It was the largest monthly drop since September 2009, shortly after the Great Recession ended. Sales declined in every category except auto dealers (up 1 percent) and home centers (up 0.3 percent). Sales fell 3.3 percent at department stores. December also saw sharp declines in the financial markets, and the stock losses may have weighed on shoppers. “The most plausible economic explanation is that long-dormant wealth effects came back with a vengeance, and consumers slashed their holiday purchases when they saw their 401(k)s going down the drain,” Michael Feroli, an economist at JPMorgan Chase, told Reuters. In the housing market, builder confidence in the market for newly built single-family homes rose four points in February, to 62, on the National Association of Home Builders/Wells Fargo Housing Market Index. All of the housing market indices posted gains in February for the second month in a row. The index measuring current sales conditions rose three points, to 67; the component gauging expectations in the next six months increased five points, to 68; and the metric charting buyer traffic moved up four points, to 48. Any score above 50 indicates that more builders view conditions as good rather than poor. Existing-home sales fell in January for the third month in a row. The National Association of Realtors reported that sales decreased 1.2 percent from December, to a seasonally adjusted annual rate of 4.94 million. Sales were down 8.5 percent from 5.4 million in January 2018. Lawrence Yun, the NAR’s chief economist, stated in a press release that the January figure was the lowest since November 2015. He did not expect the numbers to decline further in future months. The median existing-home price for all types of housing in January was $247,500, up 2.8 percent from $240,800 in January 2018. January’s price increase marked the 83rd straight month of year-over-year gains. The U.S. Commerce Department’s report on new-home sales for January was not available. It was delayed by the government shutdown.